It’s been fifty years since Antonio Grasso married Maddalena and brought her to America. That was the last time she saw her parents, her sisters and brothers—everything she knew and loved in the village of Santa Cecilia, Italy. Maddalena sees no need to open the door to the past and let the emotional baggage and unmended rifts of another life spill out. But Prima was raised on the lore of the Old Country. And as she sees her parents aging, she hatches the idea to take the entire family back to Italy—hoping to reunite Maddalena with her estranged sister and let her parents see their homeland one last time. It is an idea that threatens to tear the Grasso family apart, until fate deals them some unwelcome surprises, and their trip home becomes a necessary journey. 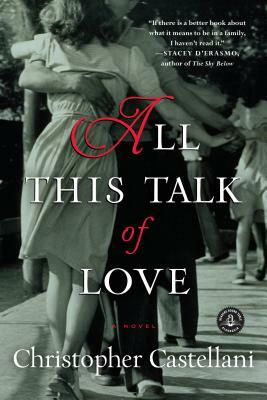 All This Talk of Love is an incandescent novel about sacrifice and hope, loss and love, myth and memory.